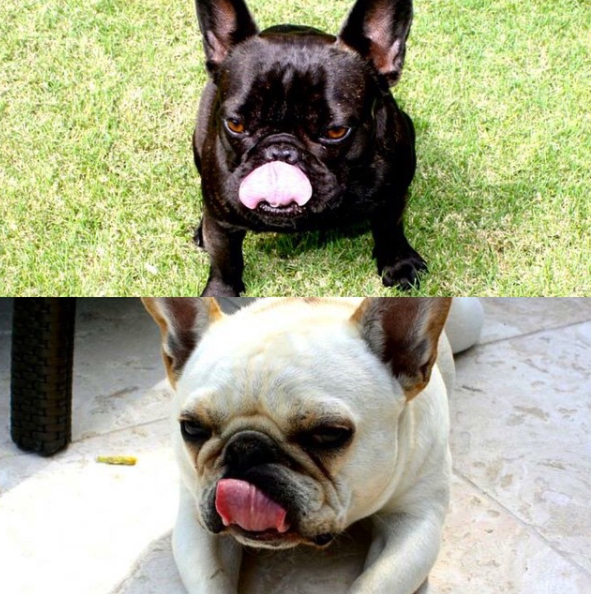 I am beyond obsessed with our frenchies and almost just as obsessed with my Del Toro shoes customized with Pierre's cute little face on them. My flats are black velvet which contrasts really well with Pierre's lighter colored face, making him really pop out. I love these shoes so much and wish that Charlotte and I were the same size foot so that we could swap! These shoes are not only adorable, but they are also super comfortable, I can wear them for hours with zero blisters to be found. I went for a casual look in my Pierre Del Toro shoes, wearing a fun color block bright red Rag & Bone 'Jana' pullover sweater with white sleeves and stripes by the wrist. This red color ended up meshing really well with Char's look - the looks connected via the red color of my sweater and the red velvet on Charlotte's shoes. Finally, I wore my (also) Rag & Bone crop distressed jeans with frayed & flared bottoms, adding some literal flare (haha) to my outfit. Cropped and/or flared jeans are super in right now and I love how my Del Toro outfit came together so easily, with only three simple pieces that were able to create an adorable look! 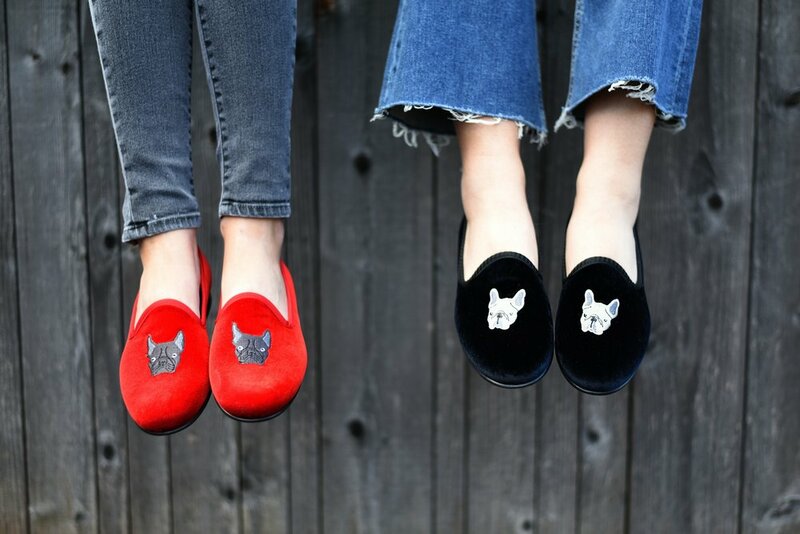 Since we have two adorable French Bulldogs, Pierre and Eloise, we wanted to rock these amazingly cute shoes by Del Toro and share them with all of you. 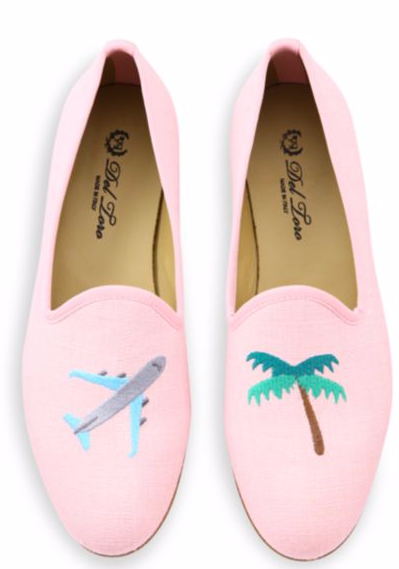 I love Del Toro shoes, for not only are they comfortable and very wearable, but they add a little flair to any outfit and allow you to customize and personalize your look. 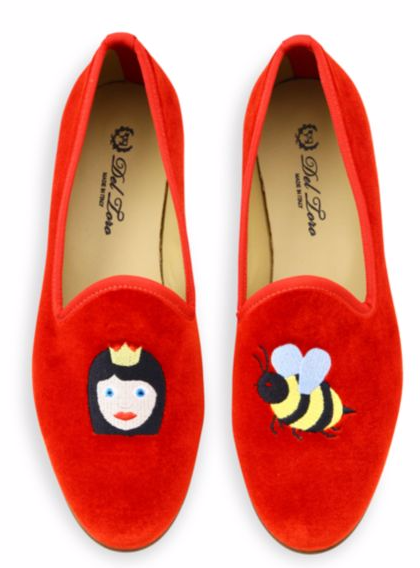 Del Toro shoes are extremely well made and extremely cute for any season. We are obsessed with our irresistible Frenchie Del Toro shoes, and I just love the red color of mine. The Frenchie images really stand out against the pop of cherry red! For my look I paired the cute Del Toro flats with a pair of grey The Great Skinny Skinny jeans and my “oh so comfortable I want to wear it every day” Enza Costa ribbed sleeveless turtleneck sweater. This turtleneck is an awesome wheat color, which goes with everything, and is the perfect weight for transitional weather. I finished off my look with my Functional faux fur leopard coat which is sadly no longer available but I have linked a very cute leopard trench which is perfect for the weather right now. The trench I linked adds warmth on a chilly spring day (like we have been having) without being too heavy and burdensome! My outfit is cute and simple allowing the Del Toro shoes to be the pop of color and excitement! !